Finding one’s voice through their art can sometimes be a tricky process. If art reflects life (and sometimes vice versa), artists must strive to replicate their experiences, thoughts, opinions, struggles, and more within their art. 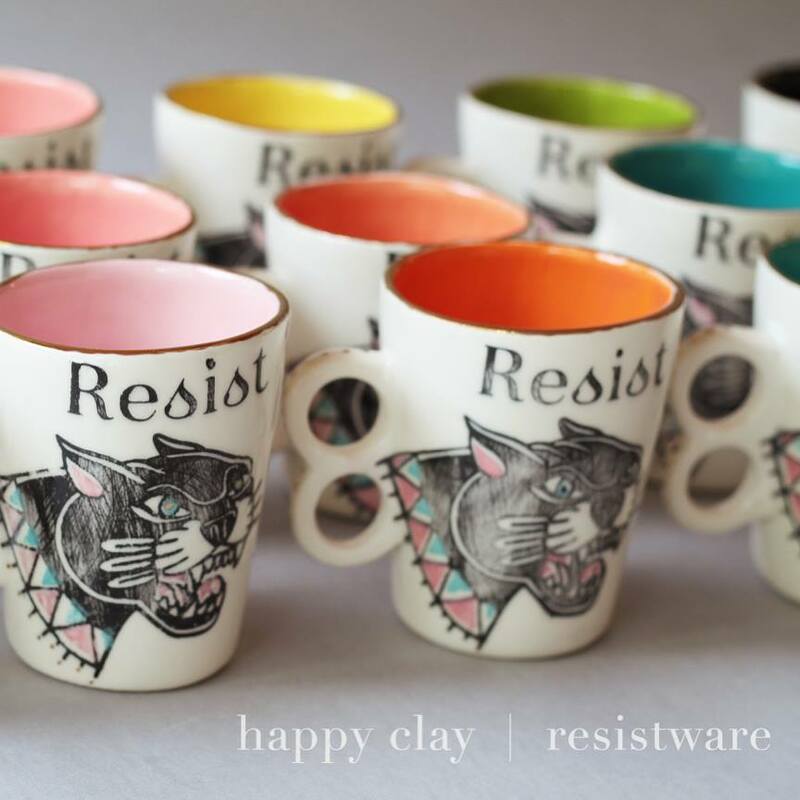 For Niki Buckley Crosby, owner and creator of local handmade pottery business Happy Clay, showing her voice and experiences through her pottery is of the utmost importance. Crosby started in New Orleans with a graphic design, web design, and photography background. “I am not trained. I made one thing in high school and I liked it a lot, but then some dumby put something in and it exploded in the kiln so I never even got to keep it,” Crosby said. She quickly realized that her work in graphic design, web design, and photography were all ideas and works of other people’s inspirations. However, she lost almost all of her business after Hurricane Katrina. She sold all of her wares from her mobile boutique business to buy her first kiln. And that was just the beginning. At first glance, Crosby’s style is unlike the traditional look of pottery. “All clay is brown, pottery is always brown. My stuff is different,” she said. Crosby adds bright splashes of colors with patterns and images along with a distressed vibe from the shape and finish of the pieces. The bright colors and distress harken images of New Orleans for Crosby. 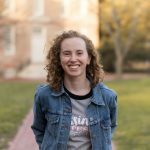 “It’s got a texture and a depth that appeals to me, and then working for years photographing the antiques, I fell in love with the little details that make something seem loved and have a story behind it,” she said. 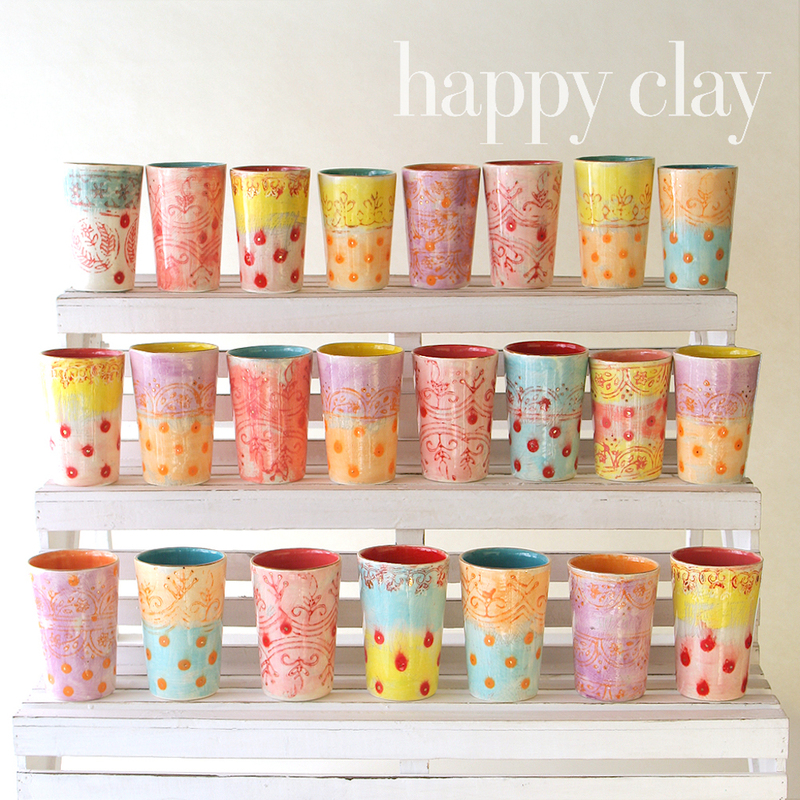 The vibrant hues and textures of her pottery inspired the name of the business after so many people called her pottery ‘happy.’ Additionally, Crosby’s years of travels in eastern Europe, photographing and traveling with local gypsies, brought inspiration for the texture from the textile stamps used on the inside of gypsy homes, or roma. One of Crosby’s most interesting- and popular- line is her Resist ‘tattoo’ line, as she calls it. 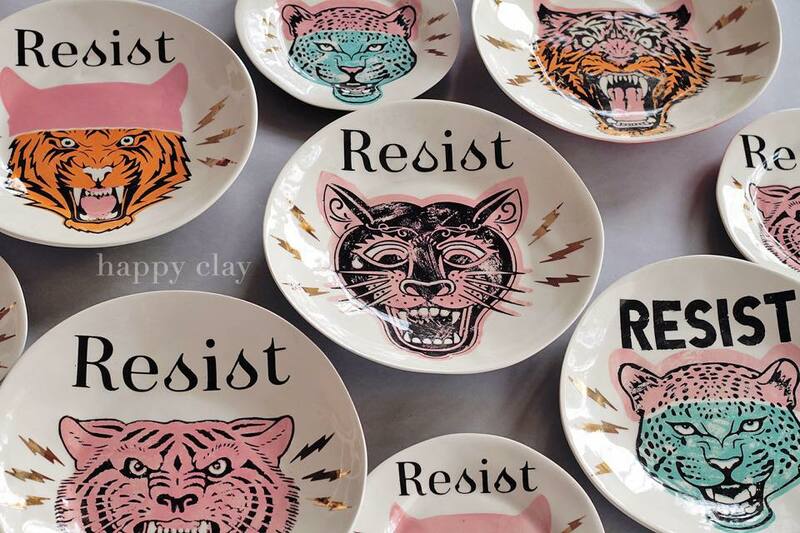 Big cats snarl from the center of the plates, surrounded by lightning bolts and the word “RESIST” overhead. What few people know is that ‘Persist’ is painted lightly on the back of the wall-to-table-plates, a little secret that Crosby appreciates. Her inspiration for the line came from the post-election frenzy. “I woke up in a different dimension on November 9,” she said. 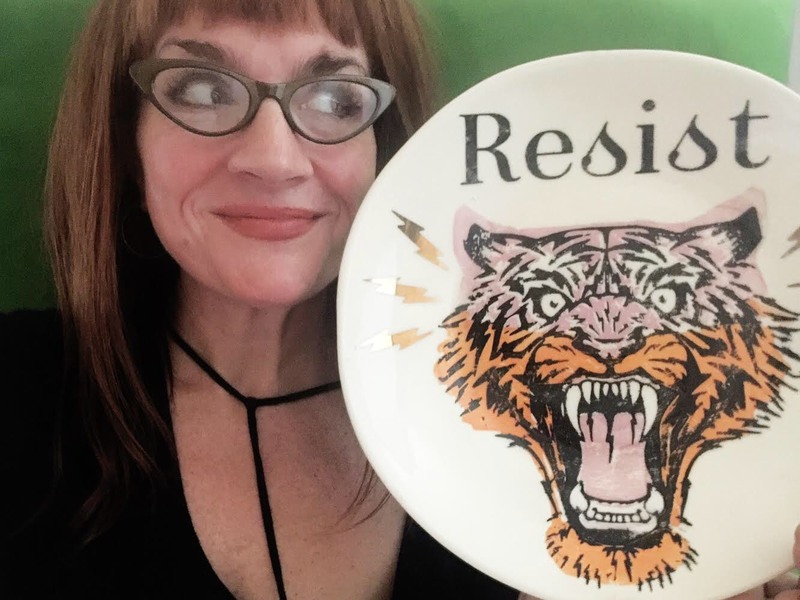 For her, the representation of the pink hats worn by the participants in the Women’s March inspired her for the central image on the plates. The Resist line holds personal meaning for Crosby. The state of our nation and the divisive current political climate has created so much tension, but also holds potential for action. And for Crosby, that means putting her voice out there. 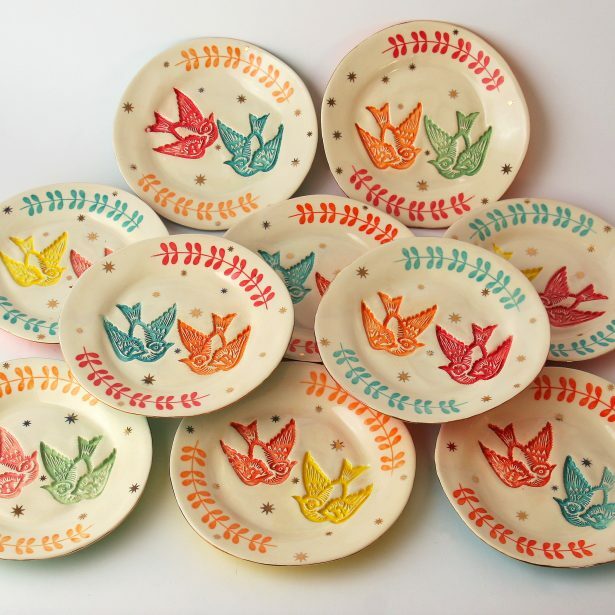 The journey Crosby has taken, both physical- from New Orleans to her travels in eastern Europe to settling in Richmond- and artistic – graphic design and photography to pottery- is reflected by her inner voice. 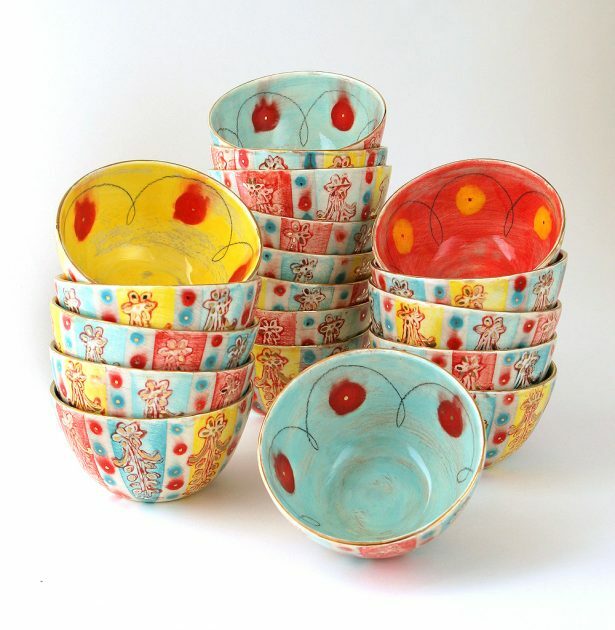 Along with that, Crosby keeps in mind that she did not take the traditional route most potters take. In a world with displacement, trauma, corruption, and inequality, Crosby finds the beauty within expressing her inner voice and relating her experiences through her art. Without any formal training, Crosby found that breaking the norm of a very old art form actually encouraged her to work harder at her craft. “I had to take the courage to do things my way versus what everybody else deems legitimate. I wanted to do something that couldn’t be duplicated; that was really important to me too,” she said.